If you want to grow and use your own herbs, or if you simply desire an attractive plant for the landscape, you can’t beat lavender. Cultivated for centuries, this charming low growing perennial has wonderfully fragrant flowers and leaves. 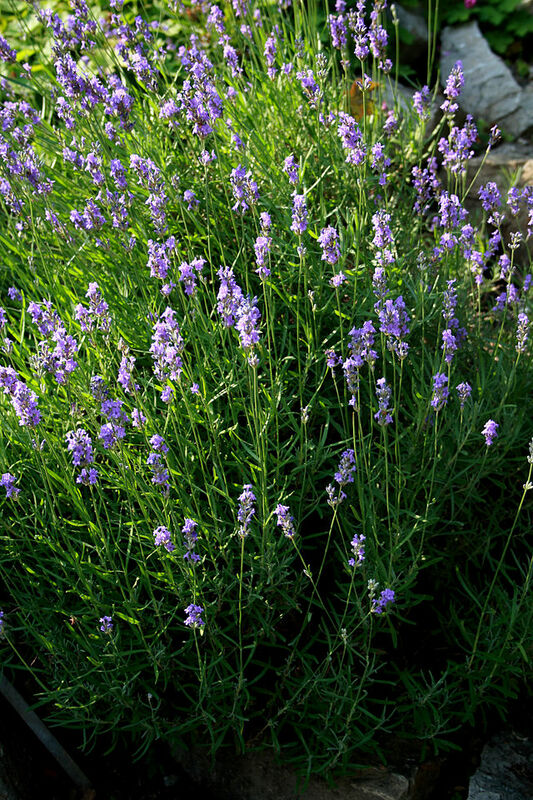 Lavender is forms a fragrant mound and can bloom for months with some added water. The name of the plant is derived from the Latin “lavare,” meaning to wash. Leaves and flowers have been used for several millennia to do just that, wash. Fragrant baths, hair rinses, to cleanse and treat skin ailments, and, in the past, to help eliminate lice and bedbugs from the household. Lavender essential oil is popular in aromatherapy. Tea made from leaves and flowers has been used to treat sleeplessness, restlessness, headache, flatulence, and nervous stomach. At this time, Commission E, a German-based group which scientifically studied herbal medicines, recommends using lavender for insomnia and circulatory and gastrointestinal disorders. 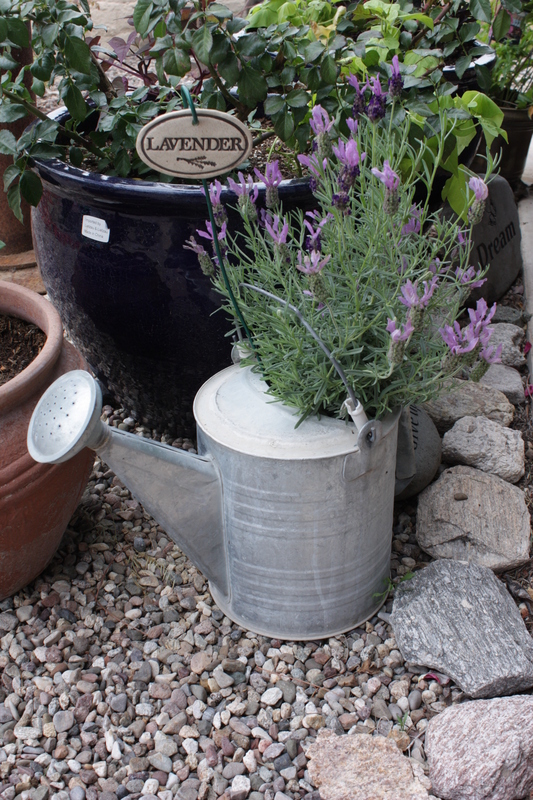 Lavender also grows well in containers, but unlike many herbs, is fussy about being moved. Lavender is easy to grow in our area. There are a number to choose from. 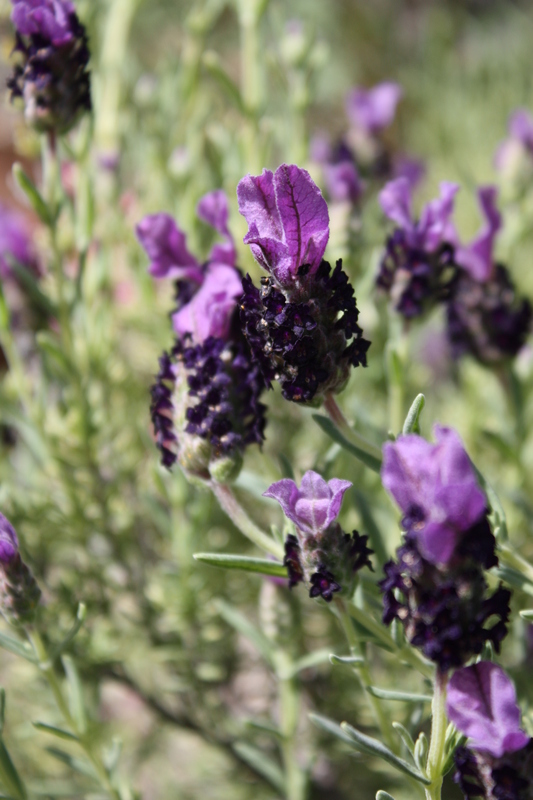 English lavender (Lavandula angustifolia) and Spanish lavender (Lavandula stoechas) both tend to be stressed by our summers, but grow well in a garden that gets only morning sun. The French or toothed lavender (Lavandula dentata) does best in my yard in full sun with some noon-time summer shade. Perhaps the fuzziness of the leaves helps reflect sunlight and reduce water loss. 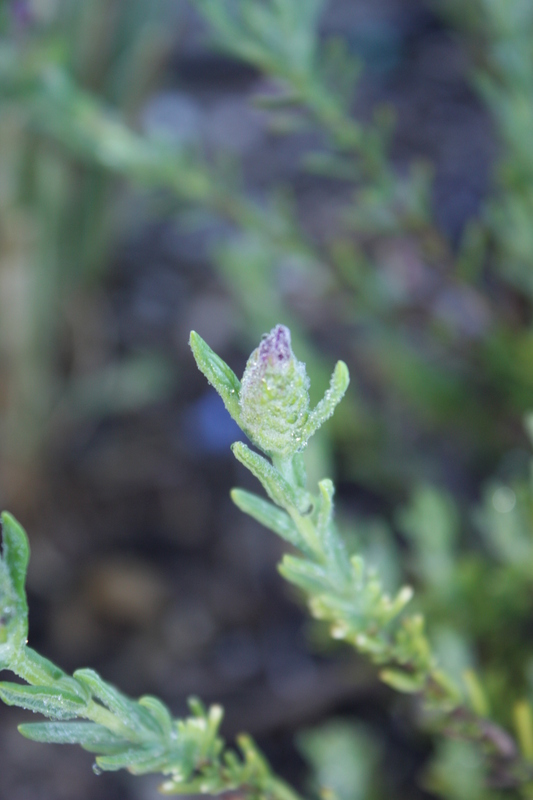 French lavender is more tolerant of the heat than its’ English cousin. 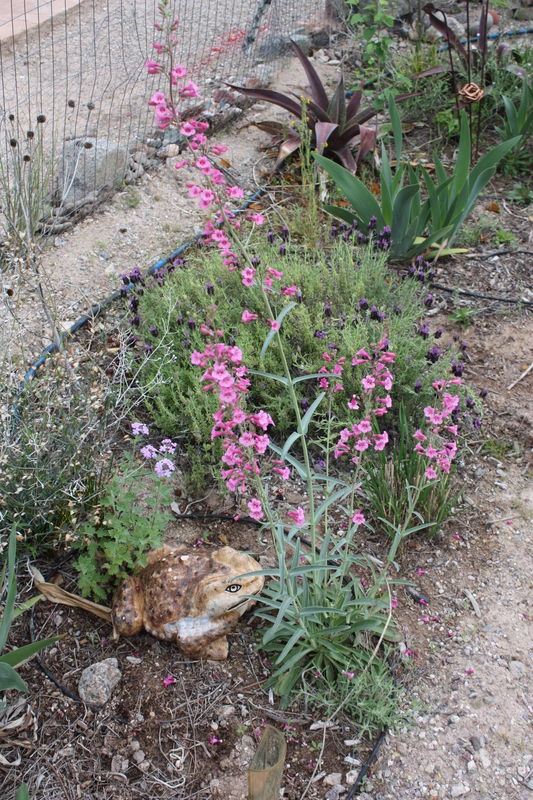 Like most herbs, all of these lavenders do best in well drained soil. They will need watering during the dryer months, but can often survive on rainfall during monsoon or winter months. Fertilize in moderation or not at all to encourage greater production of the fragrant oils. Harvest and prune often. Like most herbs, lavender should be trimmed two to three times per year to control rampant growth and keep the plant producing quality blooms. 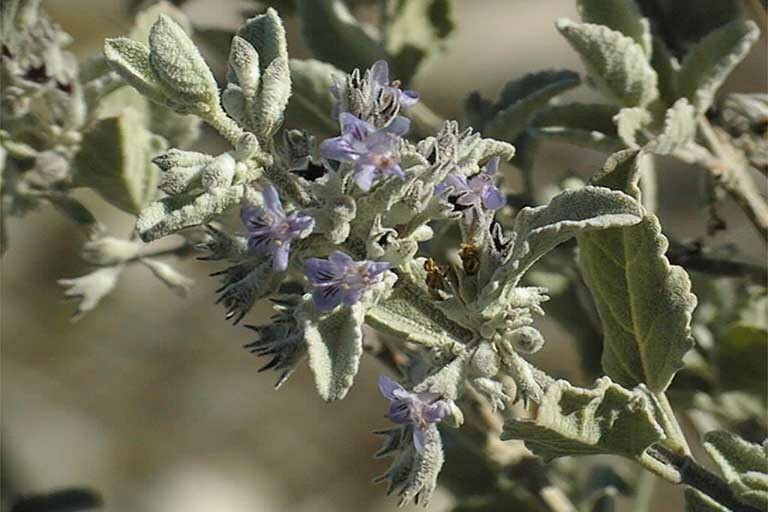 Ideally however, plant the native desert lavender (Hyptis emoryi), a shrub often found growing along area washes. 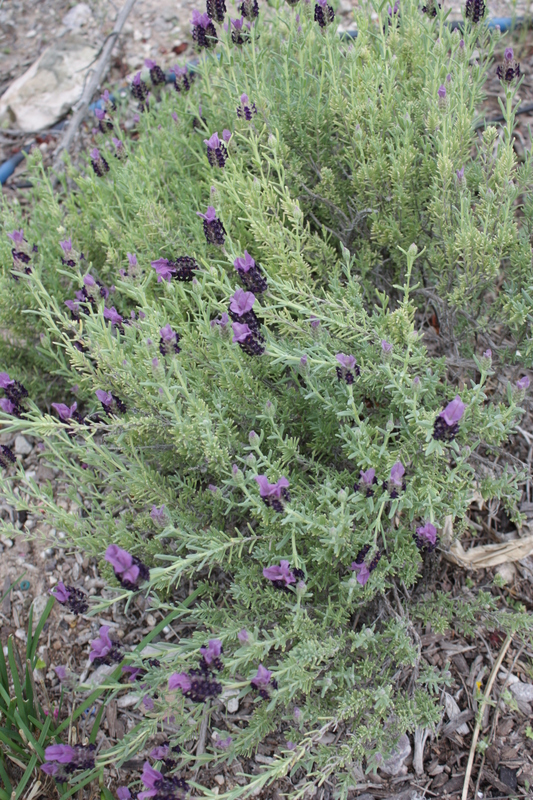 Desert lavender is a shrub reaching 4 to 6 feet high and covered with fragrant gray green leaves. Summer brings spikes of fragrant purple flowers that butterflies adore. 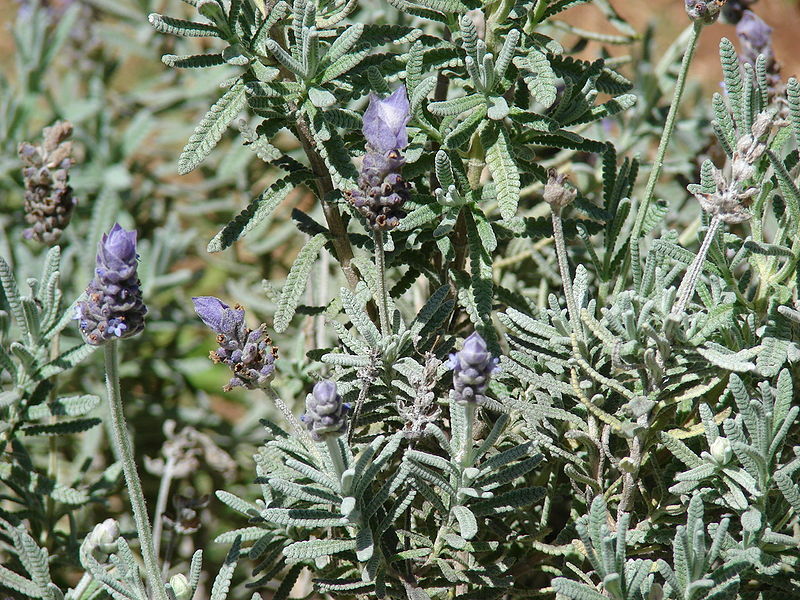 The native desert lavender is more of a shrub than its’ European cousins. Harvest stalks of lavender blooms as the lower-most flowers open. This gives you buds with optimum fragrance. Dry your lavender, like all herbs, out of direct sunlight. 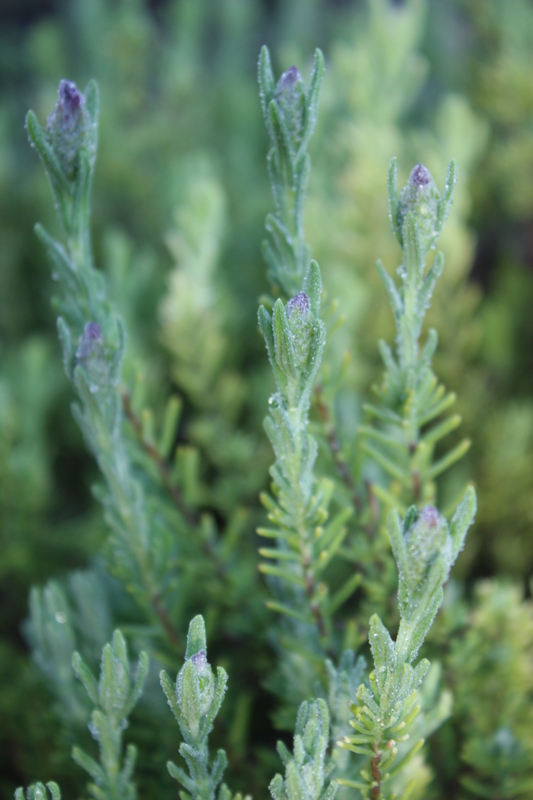 No matter what species of lavender you plant, you’ll be living green. Growing your own lavender reduces lavender imported from half a globe away, usually southeastern Europe. Growing your own also insures that you have a good source of quality organic lavender. For those exploring the energetics (chi) of products, growing your own lavender and harvesting as needed offers the many benefits of strong chi. Native desert lavender or European species, lavender adds refreshing fragrance to your living spaces, both indoors and out. Lavender and Parry’s penstemon grow well beside one another and attract many native pollinators to the garden. If you live in Southeastern Arizona, please come to one of my lectures. Look for me at your local Pima County Library branch, Steam Pump Ranch, Tubac Presidio, Tucson Festival of Books and more. After each event I will be signing copies of my books, including the latest, “Southwest Fruit and Vegetable Gardening,” written for Arizona, Nevada and New Mexico (Cool Springs Press, $23). All photos (except where noted) and all text are copyright © 2015, Jacqueline A. Soule. All rights reserved. I receive many requests to reprint my work. My policy is that you may use a short excerpt but you must give proper credit to the author, and must include a link back to the original post on our site. Photos may not be used. As I write, the citrus trees in my neighborhood are beginning to bloom and sending waves of scented the air through my exuberantly flowering garden. This is the kind of experience poets rhapsodize about. 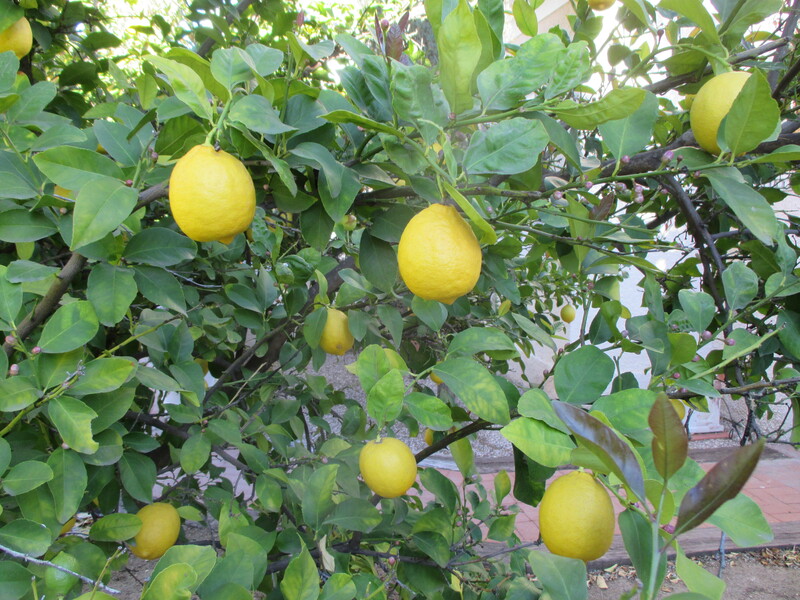 The two big freezes we had in 2011 and 2013 affected most of Tucson’s lemon trees, and some gardeners went without lemons as the trees recovered. But this spring they came roaring back. It’s Carolyn this week giving you ideas for using lemons from your own trees, those you can beg from neighbors or buy at the farmers’ market. The word “luscious” could have been invented to describe lemon curd. It’s sweet without being cloying; tart without being sour. Yum. I made it once before with so-so results. As with any recipe involving cooked eggs, there is always the chance of curdling if you don’t handle the ingredients delicately. This recipe, developed by Elinor Klivans from Fine Cooking reduces the risk. You can use your lemon curd on toast or scones or fill tiny tart shells for a dessert. 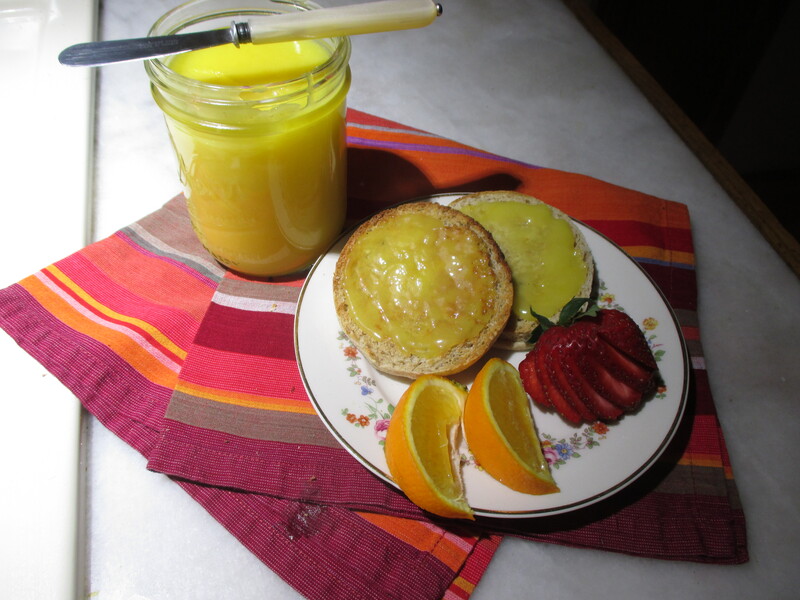 Lemon curd and English muffins make an elegant breakfast. To make lemon curd, you’ll need to zest a lemon first. You only need a tablespoon of zest. You can use a lemon zester or get finer zest with a microplane. Zesting with a simple lemon zester. 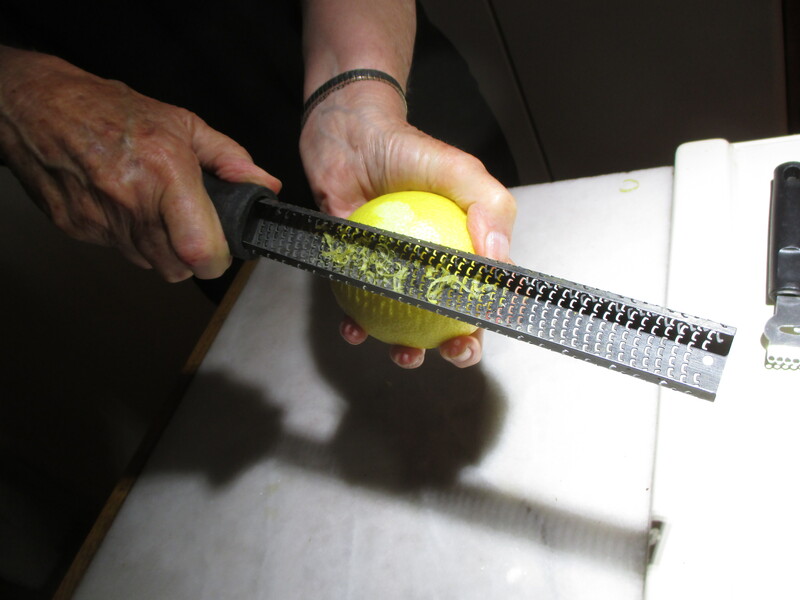 Using a microplane to make lemon zest. In a large bowl, beat the butter and sugar with an electric mixer, about 2 minutes. Slowly add the eggs one at a time, beating between, then add the yolks. Beat for 1 more minute. Mix in the lemon juice. The mixture will look curdled. Don’t worry as it will smooth out as it cooks. Transfer the mixture to a medium, heavy-bottomed saucepan and cook the mixture over low heat until it looks smooth. You will find that the curdled appearance will disappear as the butter in the mixture melts. Increase the heat to medium and cook, stirring constantly, until the mixture thickens, from 8 to 15 minutes. Don’t try to rush this. Put on the radio or some music to entertain yourself. 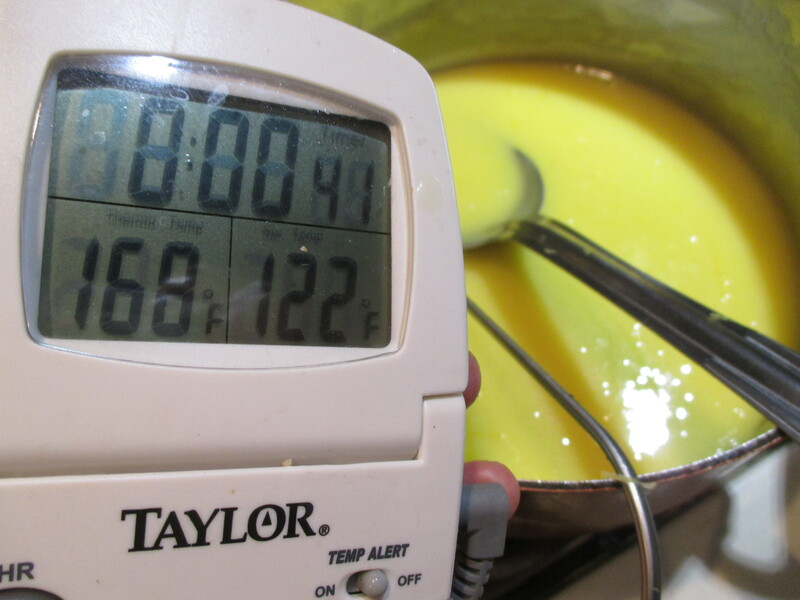 If you have a cooking thermometer, it should read 170 degrees F. when the curd is finished. The curd is almost ready. If you don’t have a thermometer, dip the back of a spoon into the sauce, and and run your finger through it. A path should remain. Most important: Don’t let the mixture boil. Test doneness without a thermometer. Remove the pan from the heat; stir in the lemon zest. Transfer the curd to a bowl. 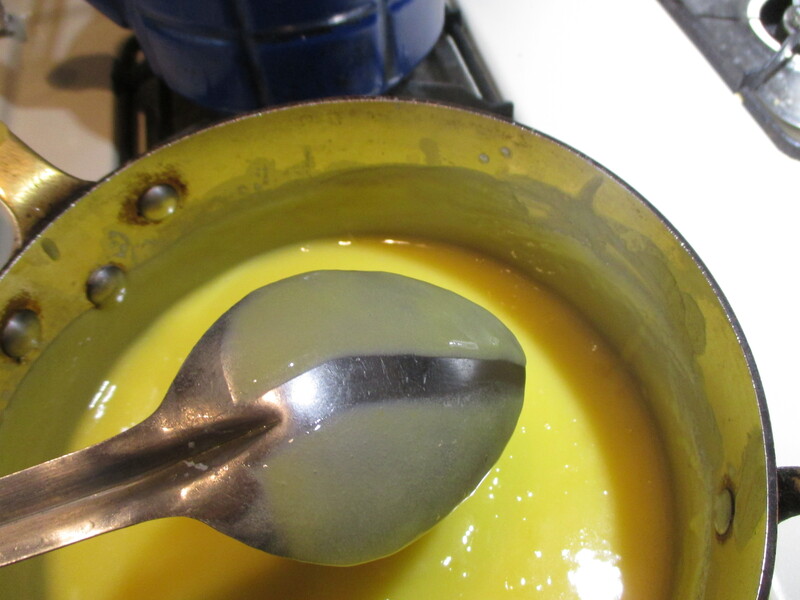 Press plastic wrap on the surface of the lemon curd to keep a skin from forming and chill in the refrigerator. The curd will thicken further as it cools. Covered tightly, it will keep in the refrigerator for a week and in the freezer for 2 months. Each tablespoon has about 50 calories. 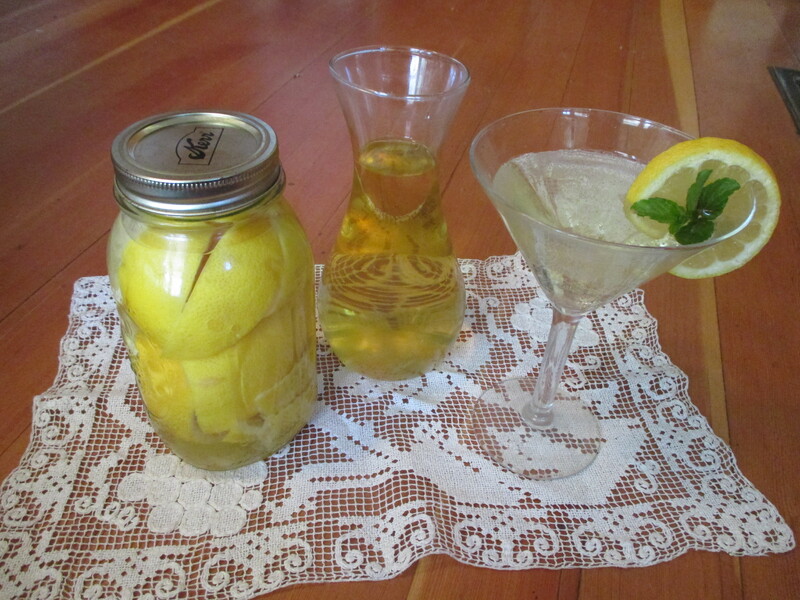 Italian limoncello is easy to make. If you have ever been to Italy, you probably know about limoncello, the generic name for an Italian citrus-based lemon liqueur that is served well chilled in the summer months. All you need is lemons, vodka and sugar. When choosing lemons you want to use organic if possible to avoid wax and pesticides on the peel. This recipe is adapted from one given by the television cook Giada De Laurentiis. Start with a clean gallon jar. 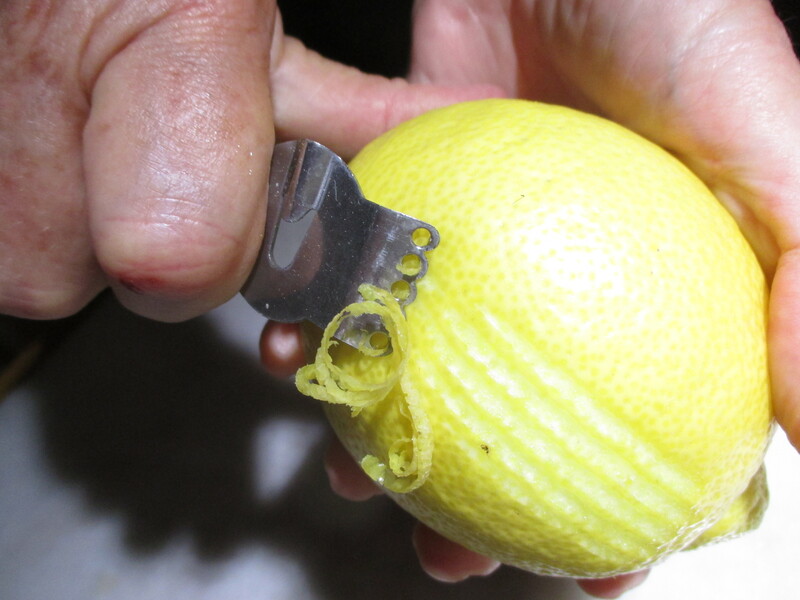 First, carefully peel the lemons in long strips with a vegetable peeler so there is no white pith on the peel. Use only the outer part of the rind. Put the rinds in the jar and cover with the vodka. Let it sit at room temperature for at least 10 days and up to 40 days in a cool dark place. When you are ready to proceed, combine the water and sugar in a saucepan, bring to a gentle boil and let it boil 5 to 7 minutes. Remove from heat and let the syrup cool. Add to the limoncello mixture and let it rest from overnight to 10 days (the experts really differ on this. I just waited 2 days and it was fine.) Strain into bottles, seal and refrigerate. Mix half-and-half limoncello, seltzer water, tonic, or champagne and serve over ice. No squeezing needed when you pour boiling water over sliced lemons. 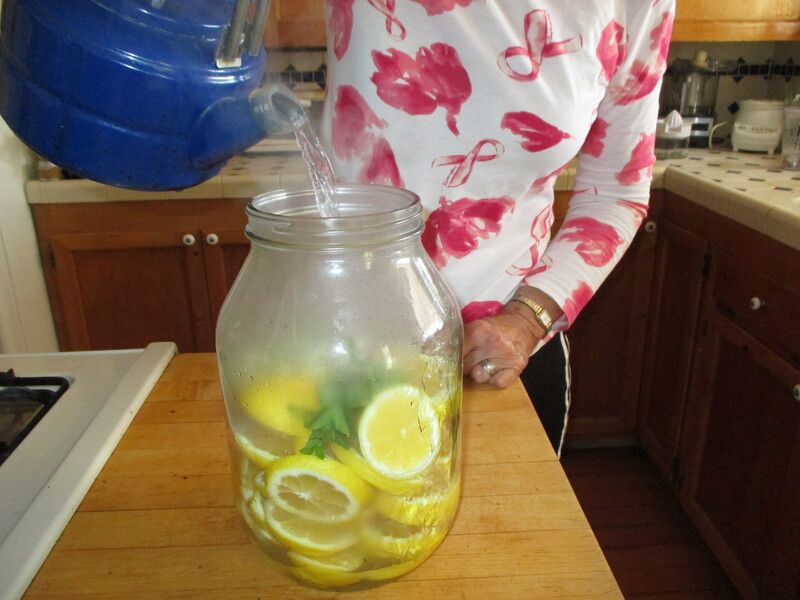 I learned to make the best lemonade from my friend Ann who lives in New Jersey. She learned it from a woman in Germany. Neither of these areas are lemon-growing regions so it may be a way of conserving. Rather than squeezing them, slice the lemons and pour boiling water over them. Let them steep for a couple of hours, pour off the water and repeat. You can keep adding water, letting it sit and draining until the taste grows too weak. This makes a juice with greater depth of flavor because it extracts the lemon oils from the rinds. Sweeten to taste with your choice of sugar, honey or agave syrup. 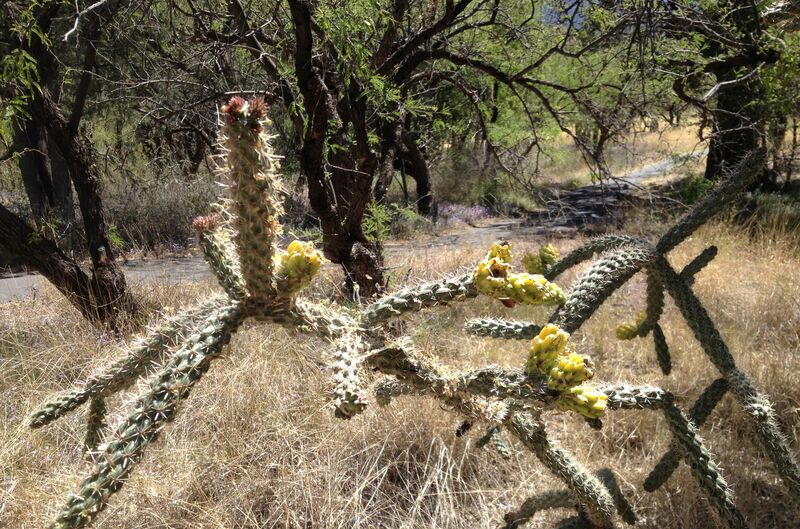 Tia Marta is running several classes in gathering and preparing cholla buds. This is a great year for desert plants and the cholla buds are fat and juicy. Here’s to the Budding Desert! Can you almost hear them? I mean the sound of buds swelling and bursting with life out there is the rain-soaked desert? This spring the wildflowers are a joy, for sure, but the perennials this season will really be in their glory. 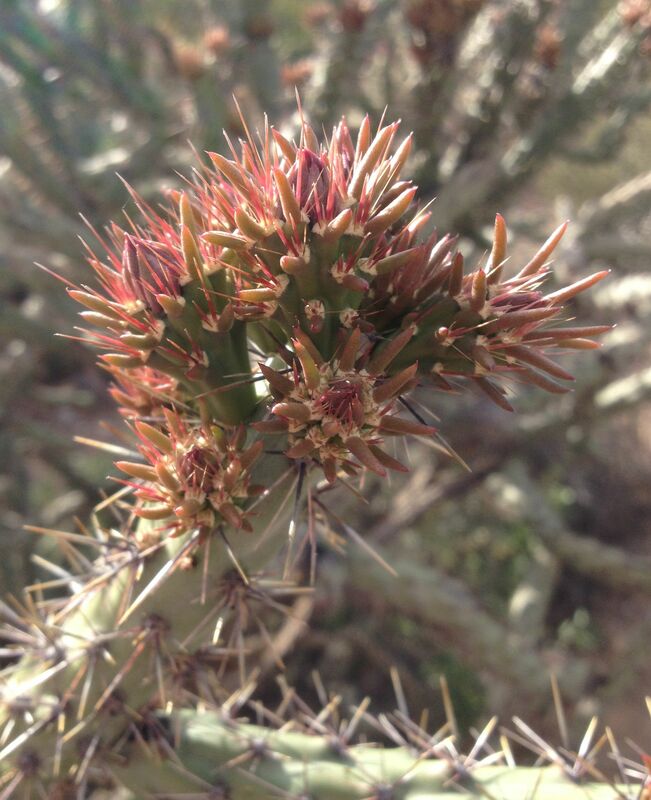 Tia Marta here with some wonderful ideas about how we can share in the coming cornucopia of cholla. It should be a bountiful bloom this year–the buds are off and running already. Every branch on our Sonoran Desert chollas is loaded with little buds, and they seem to double in size every day. It looks the same in the western part of Arizona, the Mojave….a zillion buds on the golden branches of Cylindropuntia echinocarpa. While the chollas are preparing for their yearly reproductive ritual–a wildly colorful show for attracting pollinators–many desert creatures will be benefitting from this flamboyant event, including Native Desert People who have always shared in the bounty. 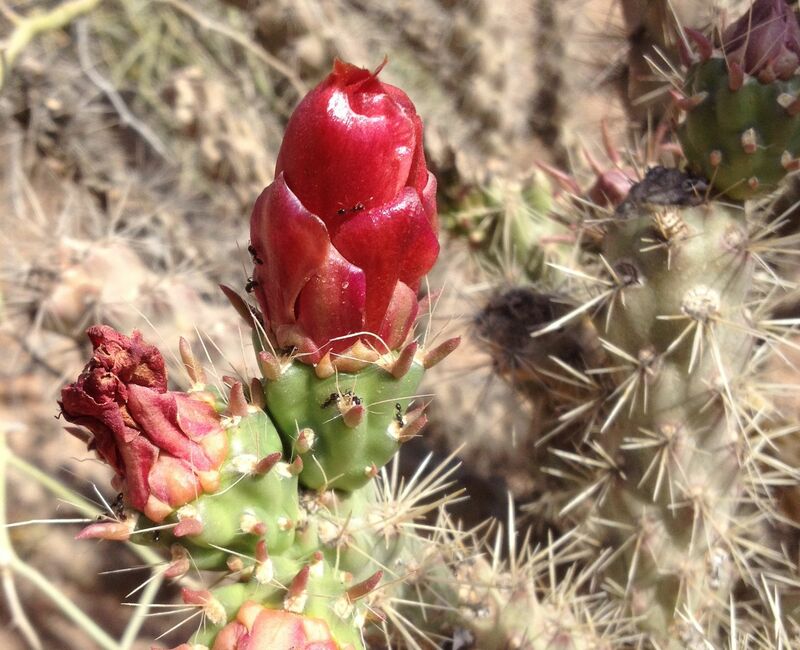 You can learn traditional and modern ways of harvesting, preparing and cooking cholla buds in one of several classes coming up soon in April. With the guidance of ethnobotanist of Tia Marta (yo,) we will get out in the bloomin’ stickery desert, get up close and personal with chollas, get to know their lore, their anatomy, their culture, learn to carefully de-spine them, cook, dry, pickle, and prep them into the most unusual and fun recipes. Their health benefits are off the charts–we’ll learn about those too. We have many cholla varieties in the Sonoran Desert—each with its own distinct characters and timing of flowering. The cane cholla (Cylindropuntia spinosior) is found in a few places in low desert but is more typical of higher desert and desert grassland. It’s the one with the persistent round yellow fruits, and gorgeous magenta flowers. The jumping cholla (C. fulgida) always has long clusters of green persisting green fruits hanging like bunches of grapes. It typically blooms with the monsoon rains of summer with a lovely deep rose flower. If you can find the buds of either of these chollas in their season, their buds are great tasting too. The buds of both are spiny, but the first-mentioned staghorn cholla (C.versicolor) bears easily-removable spines, so that’s the one my Tohono O’odham “grandmother” and mentor Juanita preferred to pick. I will be demonstrating her teaching at our upcoming workshops in April. The best instrument for safely harvesting buds is simply a pair of tongs. Long barbeque tongs can help you maneuver through hazardous cactus branches at a safe distance. 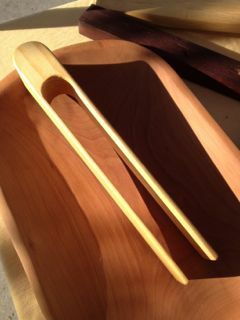 We commissioned a young woodworker from Sedona to fabricate the right size tongs for us out of fire-killed ponderosa pine—available at the NativeSeeds/SEARCH store and in our selection of handmade wooden utensils at our Flor de Mayo booth at the Sunday St Phillips market. After de-spining, the buds must be further prepared by roasting or boiling before eating them either plain as a tasty vegetable or fixing into other delectable dishes. 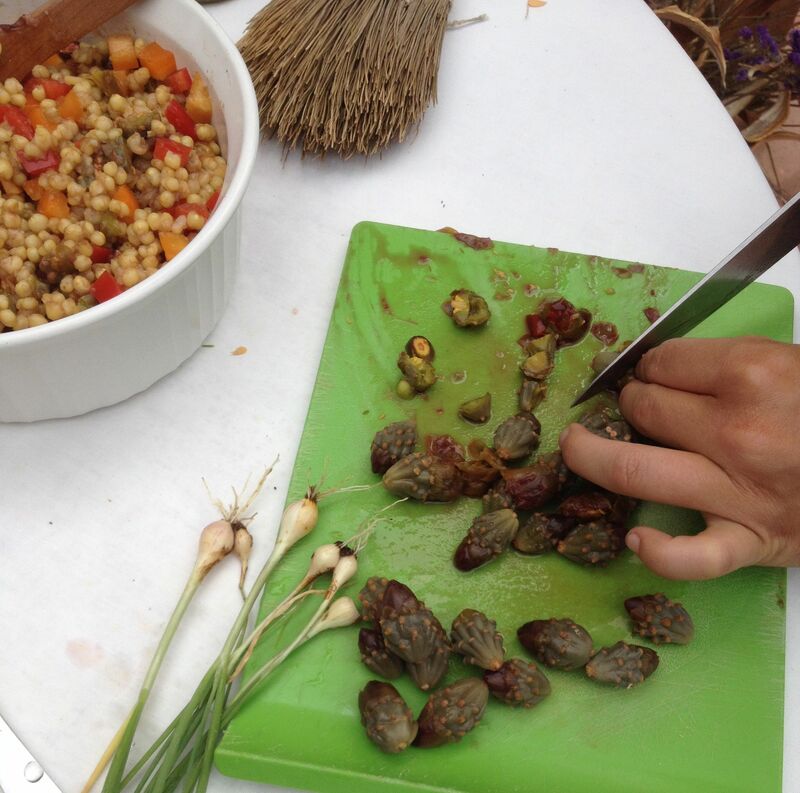 Marinated Wheat-berry Salad with Cholla Buds! 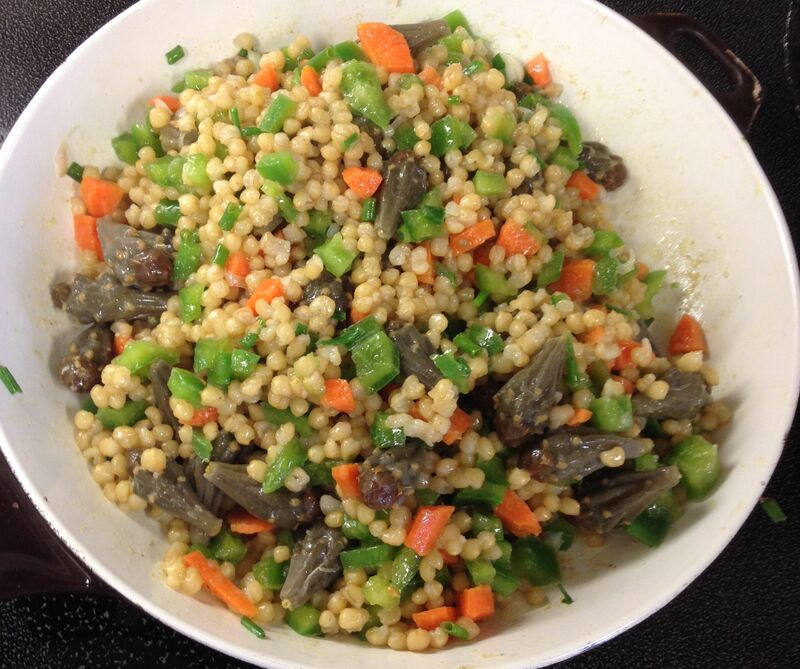 Instructions: Marinate cooked white Sonora wheat-berries in the dressing overnight in frig, stir once or twice. Mix in all fresh chopped veggies and cholla buds. Serve on a fresh romaine leaf. Makes 6 generous servings. 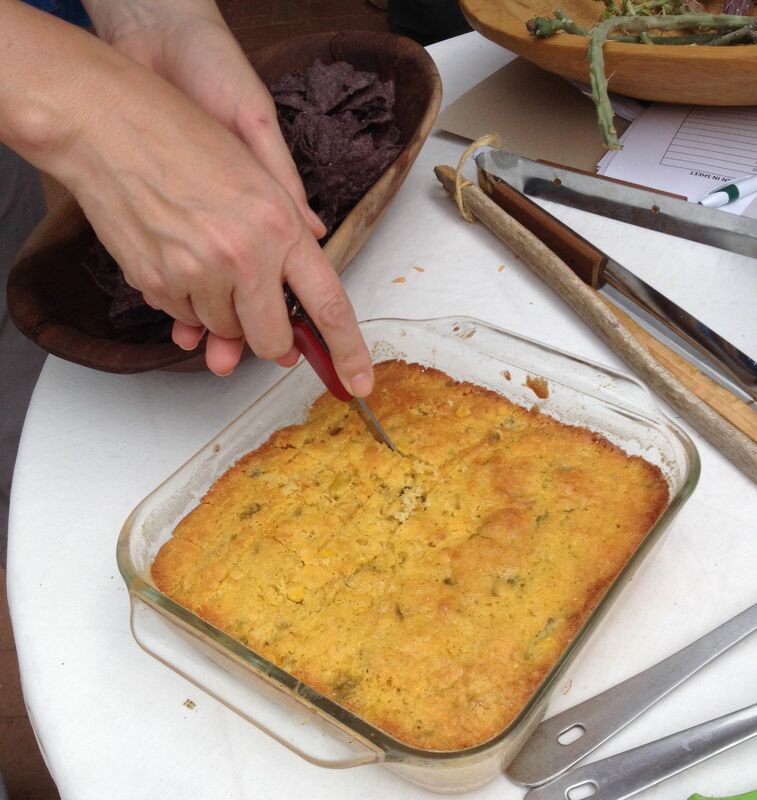 first cut into cholla bud cornbread–yum! 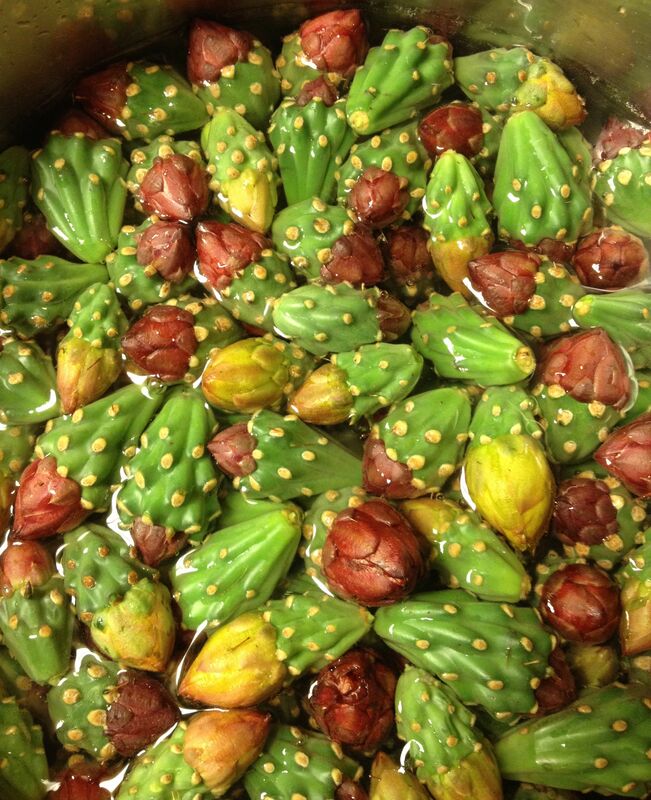 At our up-coming Cholla Bud Harvesting Workshops you will joyously taste cholla in a variety of gourmet recipes. You will a;sp learn how to preserve them, dry them for storage, learn their survival strategies and how those natural “tricks” can help us. 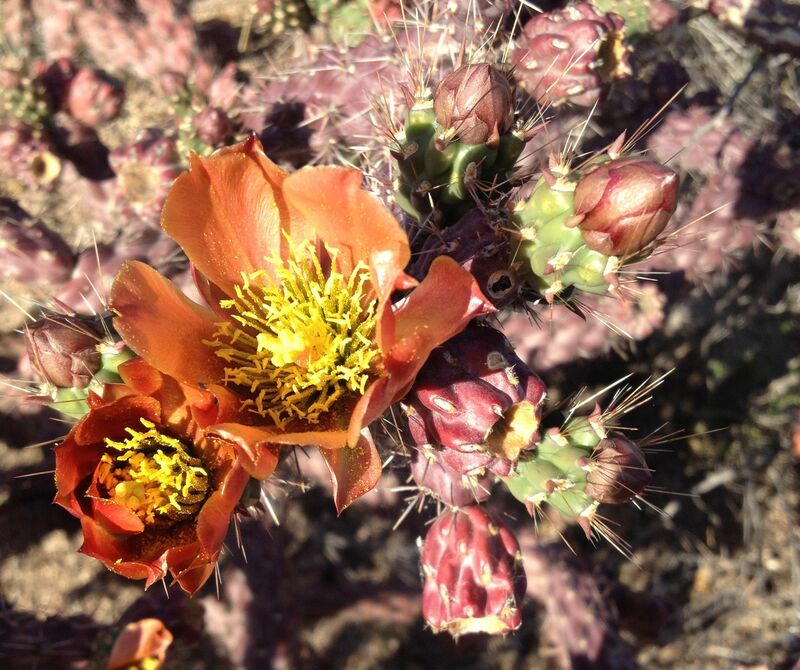 Come “internalize” a deeper appreciation of these desert treasures! For more photos and interesting details, please check out my Edible Baja Arizona article from April 2014 online at http://www.ediblebajaarizona.com. You can view a neat short clip about cholla harvesting created by videographer Vanda Pollard through a link on my website http://www.flordemayoarts.com. 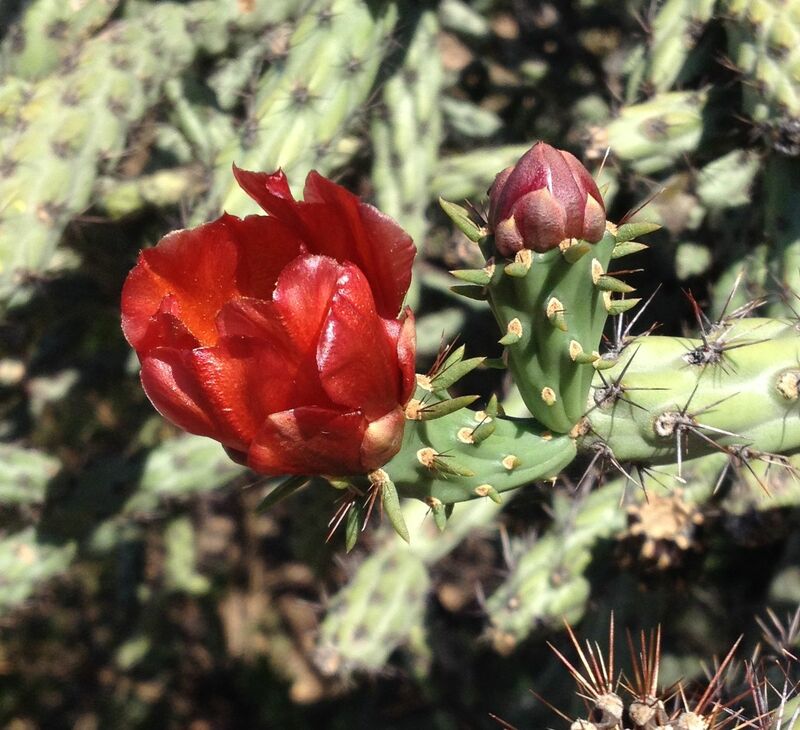 Best of all, you can attend one of our scheduled Cholla Bud Harvesting Workshops to learn the process first-hand! From there you can harvest your own–and bring these nutritious and off-the-wall taste treats into your home and party menus. Hoping to see you at one of these fun classes! 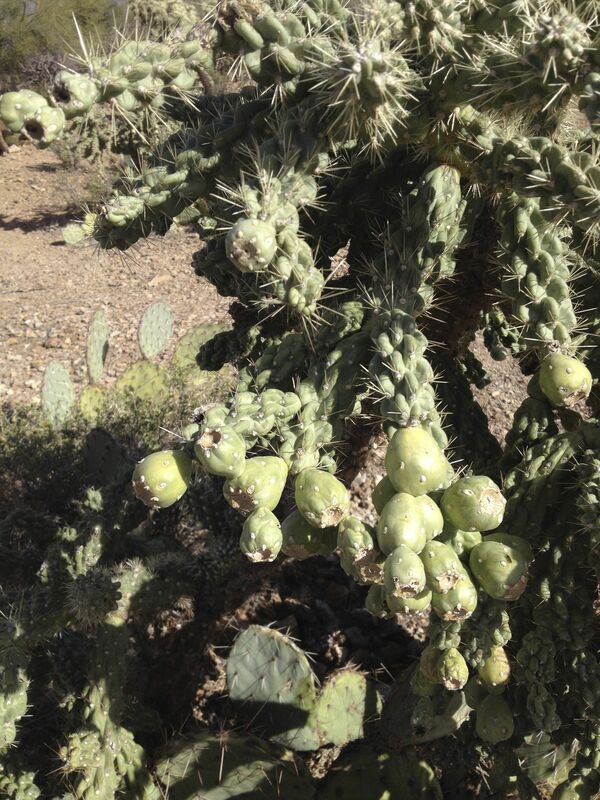 Happy harvesting–to all budding harvesters and cholla aficionados! **Certified organic heirloom White Sonora Wheat-berries from BKWFarms are available at the Flor de Mayo booth at FoodInRoot’s Sunday St Phillips Farmers Market, St Phillips Plaza, N Campbell Avenue, or online from http://www.flordemayoarts.com in ½ lb, full pound, kilo bags, and greater quantities for chefs. Also available from the NativeSeeds/SEARCH Store, 3061 N Campbell Ave, Tucson. Dry cholla buds for reconstituting to cook are available at San Xavier Coop Association booth at Thursday Santa Cruz Market and at NativeSeeds/SEARCH. We can practically taste Spring on our tongues here in the Old Pueblo. The ancient call of regeneration is in the air. Plants and Pollinators alike are in full swing. Native and non native bees are at the stone fruit trees, Birds are wooing one another with their lyrical mating songs. It is easy to forget the function some birds play in pollination. Pollination by birds has its own name: “ornithophily”. Hummingbirds, Orioles, and nectar seeking birds are but a few types of birds that pollinate native plants, trees, and crops and that animals (including humans) eat. 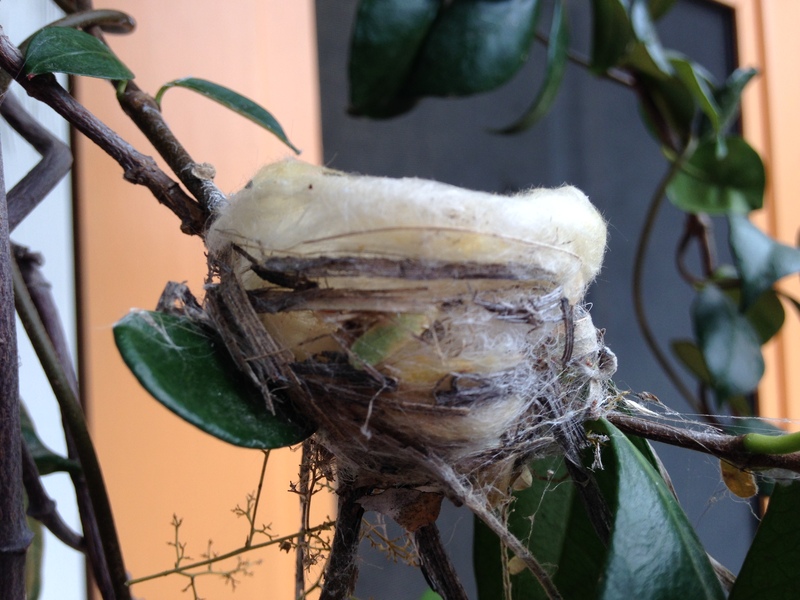 What re-focused me on ornithophily – was the humming bird nest, (right outside the front door), that a female hummer built about 19-20 days ago. Watching her secure the nest was fascinating. For about 5 days, she brought gathered materials, using beak, chin, wings and her little bird rump to form and secure the nest inside and out. When she was ready, she laid her first egg. The second was the laid the very next day. Throughout this process, I watched her bring materials, such as spider webs, to the nest. Intermittently, she would feast on the offerings of tubular flowers as well as upon tiny insects (that move in small, but visible, insect-clouds) high in the air;. Her graceful, skillful, movements allowed her to move easily among the flowers and to pick insects out of mid air. 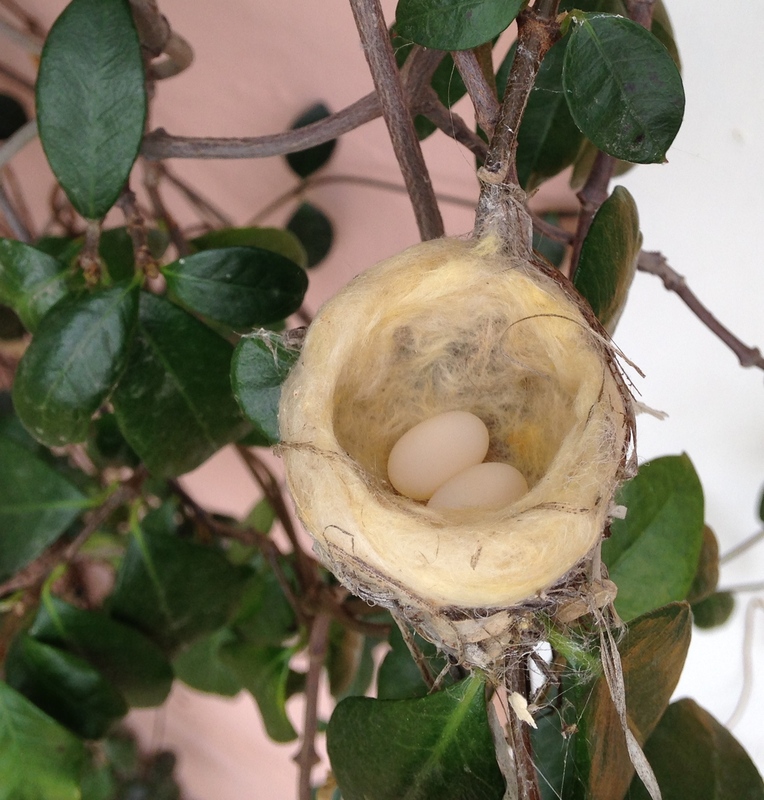 I have been studying up on humming birds nests. The bottom and the wind side of the nest is often thicker than the downwind side. The thinner sides allow for breezes to pass though on warmer days, when cooling is needed. 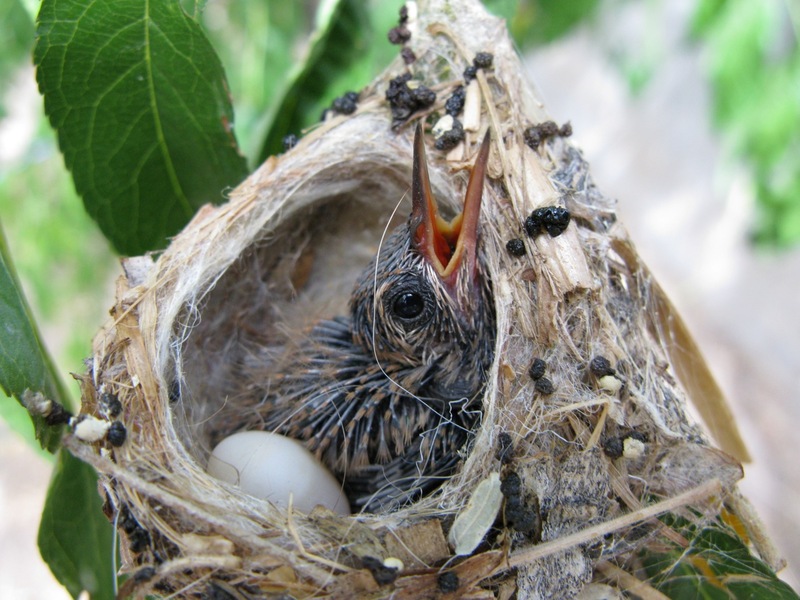 Interestingly, hummingbird nests built in the earlier and cooler springtime are thicker and deeper than those built in the warmer summer months. She camouflages the outside of the nest with materials from the immediate environment. 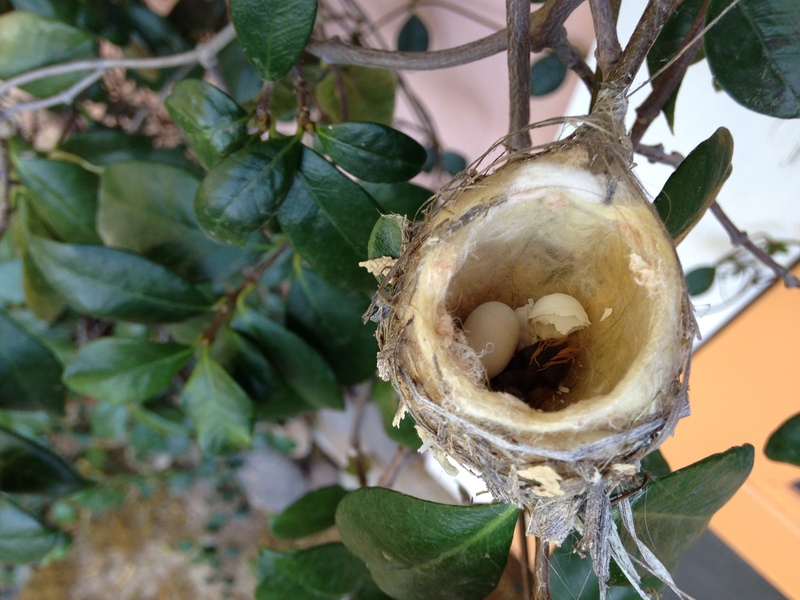 Here in Tucson many hummingbird nests have tiny mesquite leaves and strips of bark from native trees. The insides are made soft with gathered materials – over the years I have seen (in this yard alone), nests made from cotton swiped from cotton plants that we had hung on the porch from the winter, wool from a mask made of sheep hair, stuffing gathered from outdoor furniture that had seen better days. You can clearly see in the photos in this post, the innovative use of spider webs in nest construction. She uses them to secure the base, as well as to build in the capacity for elasticity into the nest – so it remains in tact even as the babies grow. The photo below is of the nest as it is being constructed – about day three or four. About 18 years ago, a docent at the Desert Museum shared a story that opened up the way I thought about the interconnectedness of things in nature. After meticulous research in to the types of humming birds, plants and habitat requirements, the Desert Museum Built a beautiful state of the art Humming Bird sanctuary/exhibit. Once the Hummingbirds were introduced, all appeared to be well – they fed and flew contentedly, living the lives hummingbirds do. All appeared fine in hummingbird paradise – except that no nest building was going on. As you can imagine, this was taken very seriously and after thorough research, it was discovered that no spiders had been introduced into the ecosystem of the site.When spiders were introduced to the hummer system, and webs were spun and thus available, the hummers began building nests. For me, this is very profound. This deep interconnectedness of spider and baby hummer. It gives practical meaning to the idea of the web of life. It is also quite a gorgeous thing to behold – this gathering of spider webs by agile hummers. The first time I saw it, it was only because the shiny sliver strands were backlit by the sun. The female gathered them in her beak, with a kind of sweeping motion of her body. Like tiny hummer nests in and of themselves, hard boiled egg whites are well built and can hold precious cargo. Packed with protein eggs are a healthy and really tasty treat. Use herbs from your own garden or local surrounds to flavor your tiny-nest- snack. 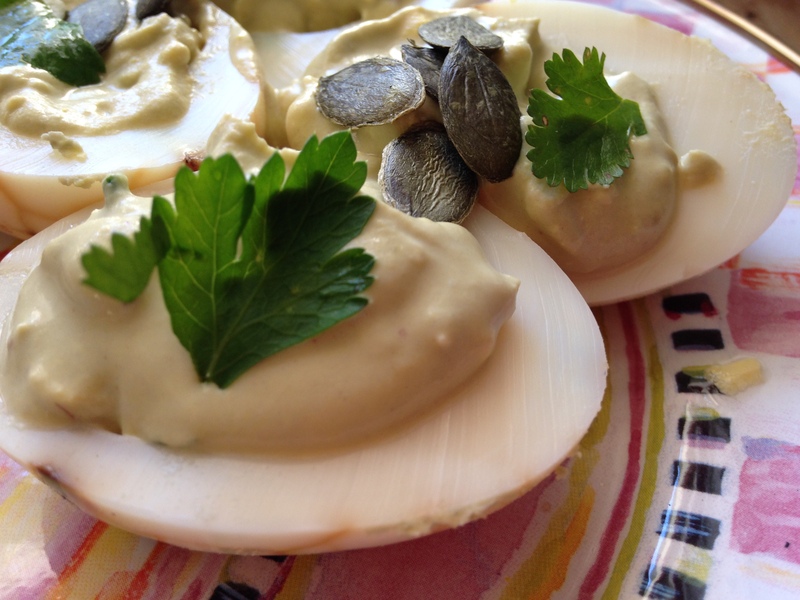 Use your favorite Deviled egg recipe, most people have their favorite one. In case you have not made them in a while, here is a basic recipe. -salt and paprika to taste. -Herbs from the garden – here I used cilantro, parsley and pepitas (pumpkin seeds), even chiltepin. If you use tea eggs, which we are going to revisit next month, you can enjoy the spider web like pattern/motif on the outside of your tiny nest ! -I often chop up the egg whites that break as I am preparing them; and add it to the “deviled egg” mixture – it makes it more like a True Egg Salad, within the tiny egg-white-nest. – Make sure to “weave in” your version of silk silver spider strands of elasticity into whatever you are incubating. *Provide nectar by planting their favorite plants (find out what is local to your region). Here in Tucson that includes wild and domestic tubular flowers such as Penstemon, which is a flower that grows wild here. Hummers likely co-evolved with long, tubular flowering plants (think the length and shape of their beaks and tongues …) and move deftly to such crimson red flowers in the herb garden, salvias , trumpet vine, penstemon, ocotillo blossoms, chuparosa tubes. They are also insect eaters, and pick the tiny, only to be seen if back lit, insects tight out of the air. *Leave spider webs – and lichen (!) if you live in a region with lichen, for nest building. The photo above is the one I took yesterday afternoon, of the first hatchling. 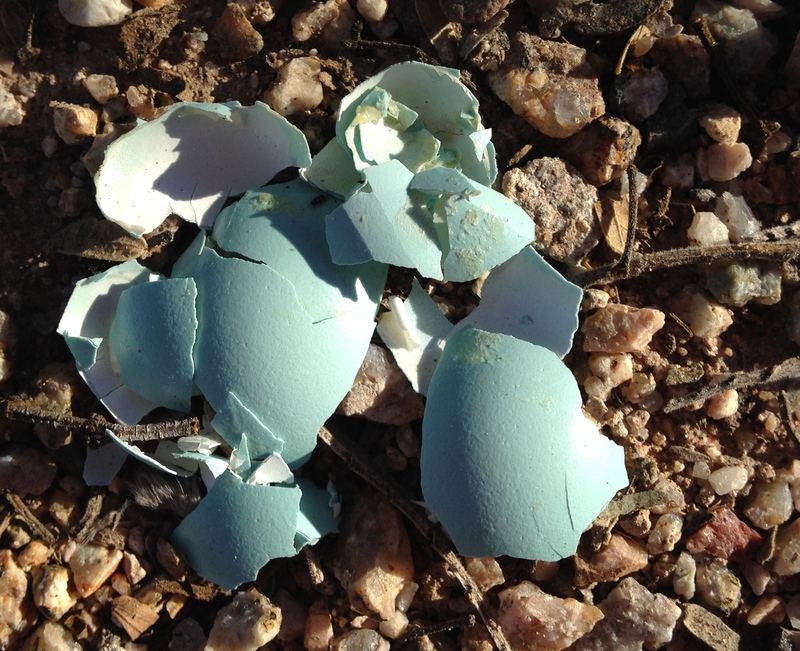 I am happy to share that the nest rode out a very gusty night and morning just fine. Let’s all send some appreciation to spiders for their webs, even when we might find them a little creepy – and to the skillful nest building of female hummingbirds.